It was just a few weeks ago when I saw something different from the familiar line up of beauty products stacked in one of the shelves at Landmark. That's actually a trait I'm pretty much gifted with, a hawk's eye on newly released products. Anyway, I was thrilled to notice that the entire display area for Belo Essentials were filled with the same stuff but with a new look. I eagerly scanned through them and almost jumped with excitement when I saw this.. 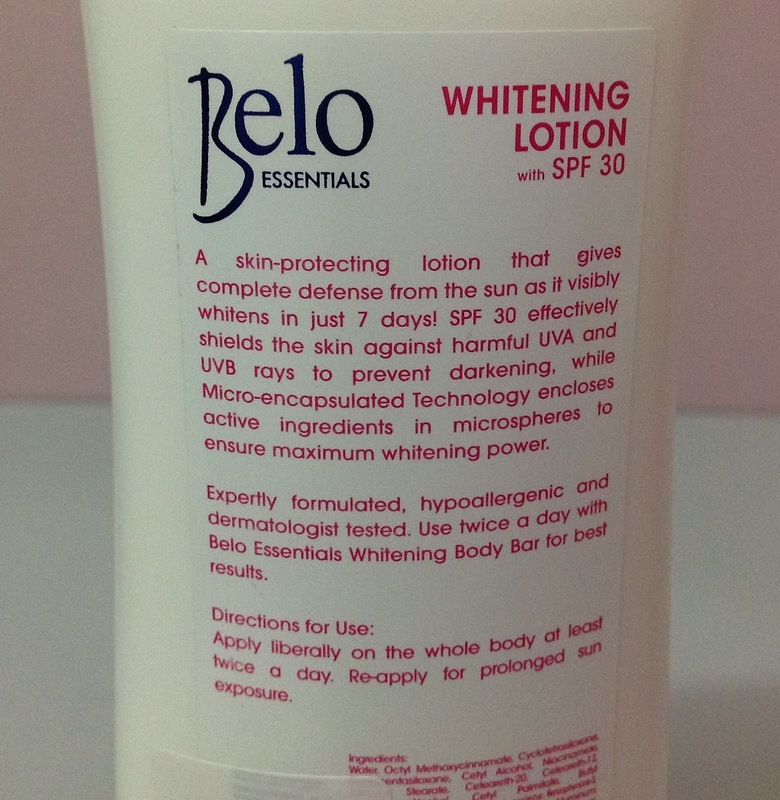 The new and improved Belo Essentials whitening lotion NOW with SPF 30! Okay, this may sound a little over the top but I'm very much particular with sun protection. So much so that even if I slathered on a hefty amount of sunscreen, I still avoid direct sun exposure even for just a few minutes. This is why I salute Belo essentials for taking the bar a notch higher in terms of skin protection by increasing the SPF content without the additional cost. You read that right. I was keeping my fingers crossed as I looked for the tag and was more ecstatic to find out that the price didn't change at all despite the improved formula. By the way, I have this habit of keeping the tag on so I'd know how much I purchased a certain item. I also write the date of purchase on the tag so I'd keep track of how long it lasted. What the label says is quite catchy especially the part saying 'it visibly whitens in just 7 days'. The micro-encapsulated technology is another thing that drew my attention. It says that this technology encloses active ingredients in microspheres to ensure maximum whitening power. These are claims that I do hope Belo essentials can truly deliver. I don't have any issues about this product but I do hope they can live up to their claims and truly deliver maximum whitening power with visibly whiter skin in 7 days. Maintaining skin cleanliness and moisture are not enough to keep your skin healthy. You must also PROTECT your skin from sun damage hence you need a product that doesn't only moisturize but also offers an SPF of at least 30 and protection from both UVA and UVB rays. Fortunately, Belo essentials have all these which is why I recommend this to all my friends. Will I repurchase? Yes, this product is a must-have on my list. After months of using it, did your skin really lighten? I mean, like honestly? Hi there, honestly I haven't seen any changes in terms of skin lightening but I still love using this product for sun protection. Hi Pj, yes this product has parabens but not as one of the main components. Parabens, especially in the small amounts used in personal-care products, do not pose a significant health risk. I hope this helps!